Scheduled: Activities dated in the future. Click the Add A New Activity button. You will then be prompted to enter the details of your activity. If you are back logging hours, the date should be the first date this activity occurred. Set the end date for your recurring activity. 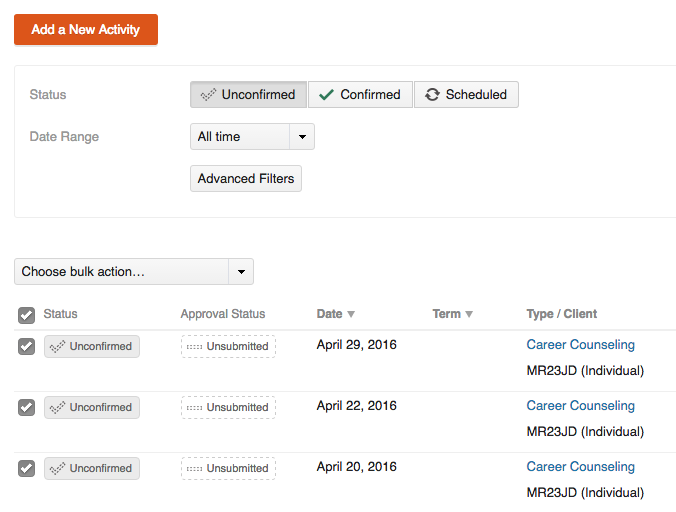 To confirm a recurring activity, navigate to the day the activity occurred in the Activities Calendar view. Move your cursor over the activity and click the checkbox button. The activity status will be changed from Unconfirmed to Confirmed. If you are backlogging activities that occurred in the past or have not logged into Time2Track in a while, you might have many activities that need to be confirmed at once. In order to do this, you will use Time2Track's bulk editing tool. Go to the Activities List view, then use the filtering options to show only Unconfirmed activities. Select the appropriate activities from the list (or click the top checkbox to select all the activities on the page), then choose Confirm under the Choose bulk action dropdown list. Click Yes, Confirm when prompted, and your activities will be confirmed. You can confirm up to 25 activities at one time, so if you have multiple pages of unconfirmed activities, you'll need to follow the steps above to confirm the 25 activities on each page. 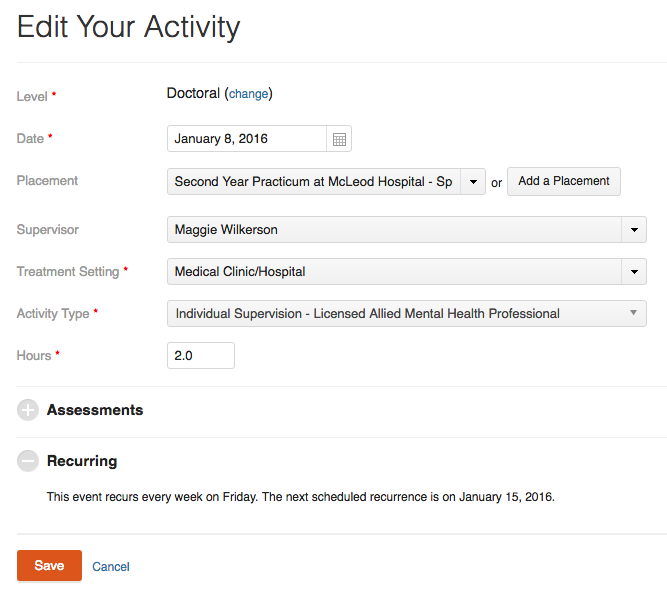 You can edit single instances of recurring activities in Time2Track the same way you would edit regular activities. Find the activity in the Activities Calendar or List view, click the activity, make the appropriate changes, and click Save. To edit a series of recurring activities in Time2Track, you can use the bulk editing tool. 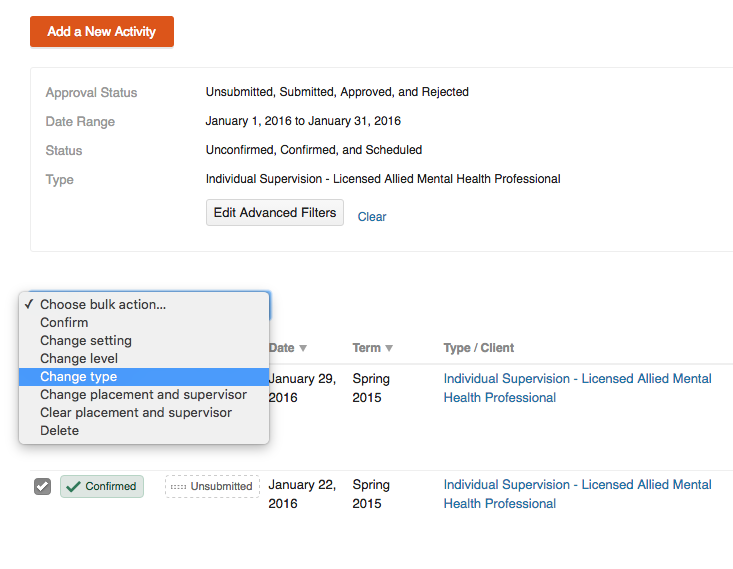 Go to the Activities List view, then use the filtering options to find the activities in the recurring series you'd like to change. Select the appropriate activities from the list (or click the top checkbox to select all the activities on the page), then choose an option under the Choose bulk action dropdown list. Next, follow the prompts to make your changes to the recurring activity series. To delete all future occurrences of a recurring activity series, navigate to the date of the first activity in the series you'd like to delete in the Activities Calendar view. Move your mouse over the activity you want to delete, then click the X button. A popup will appear with options to Delete this activity OR Delete this and all future activities. Click Delete this and all future activities and the remainder of the activities in this recurring series will be deleted. Remember, there is NO UNDO.